Earlsfield Park is a prestigious employment and housing location within Knowsley, Merseyside. 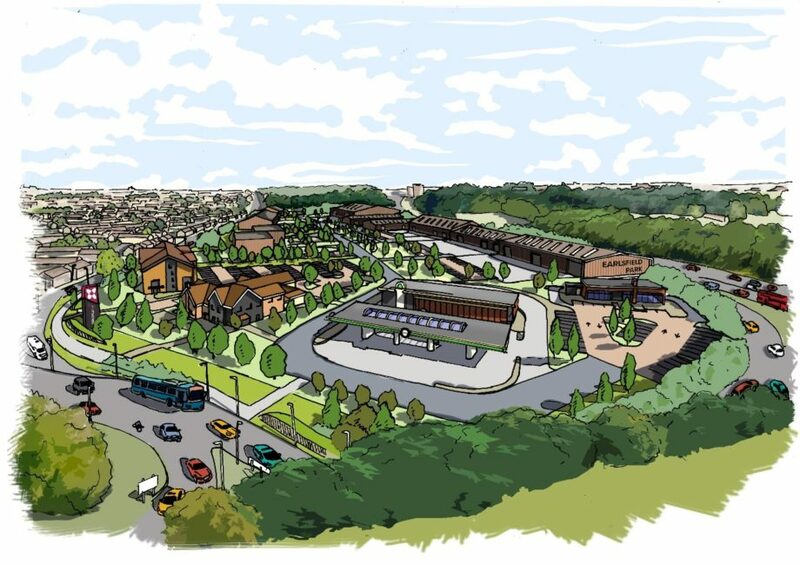 The development proposals were for a mixed-use business [employment] park and residential scheme that would contribute to the city region’s economic growth, building on the success of the nearby Kings Business Park, while the sustainable, high quality family housing will help to broaden the district’s housing appeal. An outline planning permission for up to 26,350 sqm of employment floor space (Use Classes B1/B8) and associated landscape and infrastructure. Enzygo’s role was initailly to produce the green infrastructure framework and landscale masterplan, the purpose of which was to retain the existing key features whilst providing a coherent and unifying landscape across the whole of the site. Strengthen community and cohesion creating green spaces and movement networks encourage social interaction, and improving community facilities such as the playing fields and woodlands. As a learning resource for local schools and communities to learn about wildlife and food growing etc. Manage the environment using the green infrastructure to manage flood risk and microclimate. 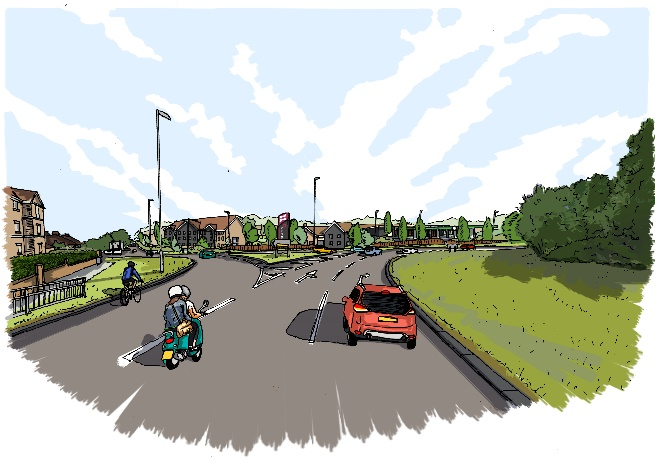 New footpaths and cycleways were created to connect the existing open spaces, woodlands and playing fields, whilst also providing the opportunity for an appropriate route for vulnerable non-motorised users along Knowsley Road. The new residential and commercial development, located on the northern edge of Huyton-with-Roby, is within easy reach of the local amenities. The masterplan creates a series of useful community spaces, linked by streets and footpaths, which have all been designed to encourage pedestrian movement. The green space network also incorporated existing trees, woodlands, hedgerows and drainage features [streams, rivers and ponds] including an extended and enhanced footpath network linking the various spaces. The green spaces are distributed throughout the development, all are easily accessible from the street network and all include high quality landscaping. They also include a variety of differing types of space, ranging from woodlands, through amenity spaces for residents, to larger community facilities. These spaces would be designed to be overlooked to provide passive surveillance and encourage active use. Open spaces would also be designed with an emphasis on the use of native tree planting, and the inclusion of meadow areas and meadow edges. 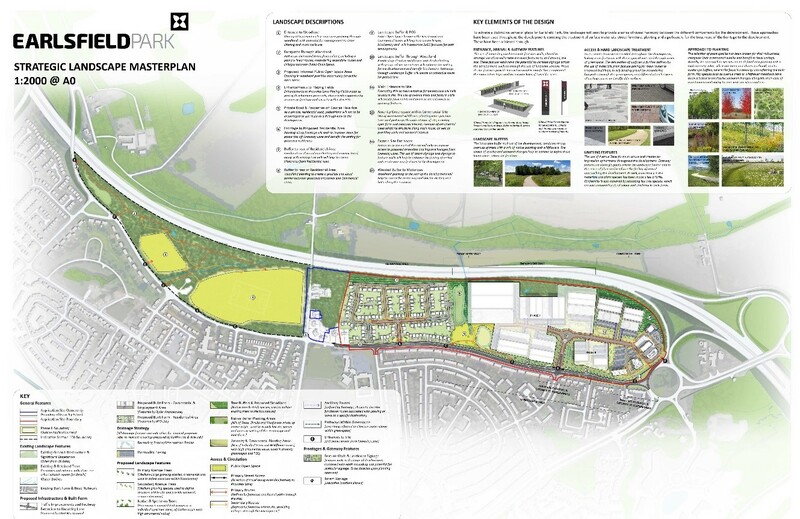 These elements will improve the biodiversity of the site and area as a whole. The housing areas have been set out in a simple and easily understood pattern. Back garden areas form the core of each housing group, and all the houses would face out on to the developments roads. 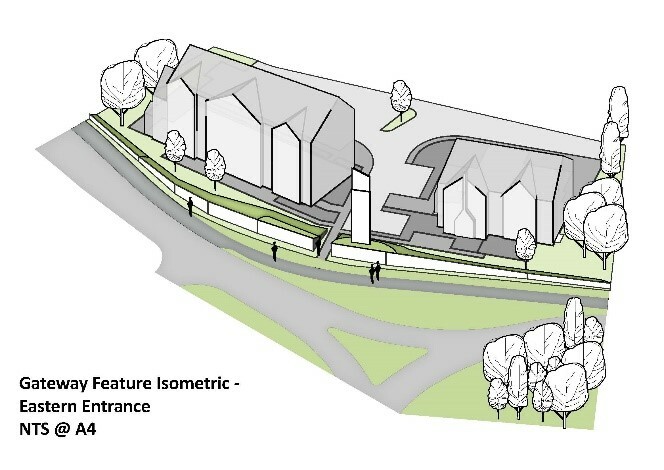 This pattern will help ensure passive surveillance throughout the site, encouraging safe active use of the whole development. The incorporation of, and addition, of significant new tree, woodland and hedgerow planting within the existing green infrastructure as well as drainage features [streams, rivers and ponds] and enhanced footpath network linking the various spaces. 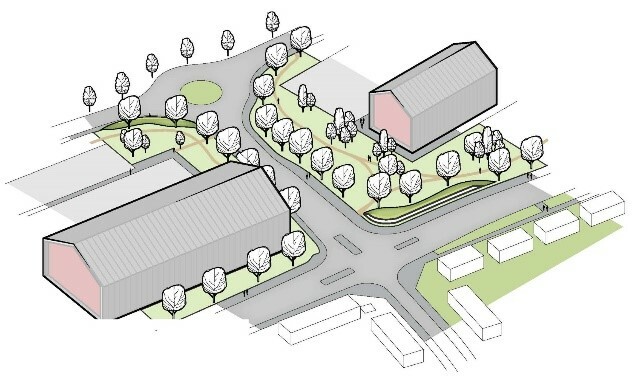 The soft landscape elements and planting typologies proposed included: ground modelling, aquatic and marginal planting, ornamental and naturalistic planting, habitat improvements and the pro-active management of newly planted, mature tree stock and the woodland areas. As with the general design approach, the planting strategy comprised a series of clear typologies that correspond with each of the key areas of the site. Design proposals aim to ensure visual linkage, continuity and consistency in finished planting and, importantly, that species suggested are considered appropriate to the ecology of the existing site and the wider borough. The existing mature woodland and hedgerows formed a key component, influencing the landscape character of the site and ensuring their future sustainability. The purpose of the new planting was to create a secondary, but nevertheless legible, layer that enhances the landscape pattern, which is so dependent on the existing mature vegetation. Where the removal of trees and hedgerows was required for operational and safety reasons they were replaced with suitable indigenous planting. Build on the existing site character giving the site a strong sense of identity that users can relate to and take pride in. 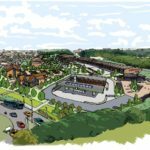 Enzygo’s landscape and masterplanning team continue to support the design team through the planning process by providing additional information in response to questions and requests for additional information by the local authority. 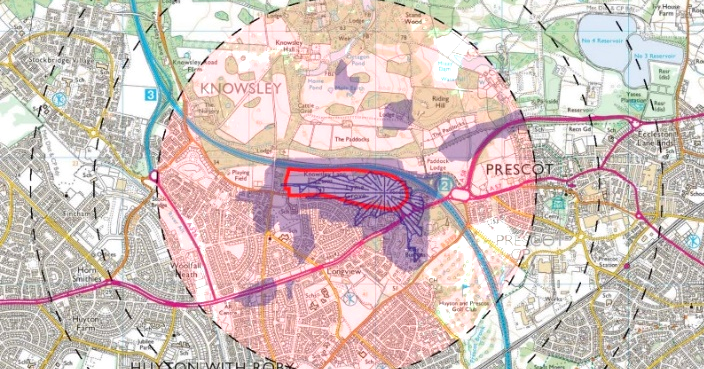 This has included a series of electronic Zones of Theoretical Visibility [ZTV’s] illustrating the potential visual impacts upon the Registered Park and Garden and Listed Hall within Knowsley Park.